Before I begin…please note…you can try Energems for FREE! Just visit their Facebook fanpage and sign up. You’re gunna want to do that TODAY! Rohan likes to wake me up at 6:30 on good days. 5:30 on bad days. Let’s just note that first. I was very much a coffee person when I was working 9-5. I’m now all about tea, but can’t OD due to pregnancy. I was able to try some delicious Energems on one of the 5:30 days and I think this is something I’ll be buying in the future. I only had one, which is silly because the serving size is 3, (and is only 15 calories!!!) but I got nervous since I wasn’t certain they were pregnancy friendly. He’s eaten the rest of the box all up. I had to remind him that they were energy candies and not just little chocolate treats with no purpose.This candy coated chocolate energy gem is packed with B-vitamins, caffeine and a proprietary energy blend. 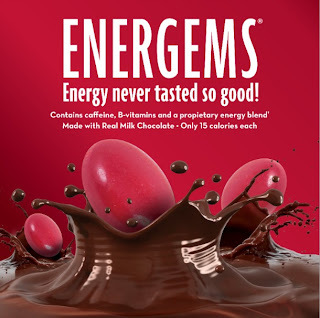 The Energems come in three flavors, chocolate charge, mint fusion and peanut butter blast. I didn’t get much of an energy boost since I only had 1/3 of the serving, but John sure as hell did! He did dishes, put clothes away, took care of Roey for me and did it all on one foot. 🙂 He said he felt more energetic and alert but didn’t feel jittery. Now, he used to be the king of energy pills, energy drinks and coffee in the past and he said he liked these better. The calorie count is much better than an energy drink and….my fave part…the price is much better!! Speaking of price, I’ve got a bonus for ya!! Use the code ‘GETLUCKY‘ at energems.net to receive 30% off your order! Remember: You can try Energems for FREE! Just visit their Facebook fanpage and sign up now. Please visit Energems for more info. Have you tried these before? Do you love em as much as John? Haven’t tried these before but I’ve heard some good things about Energem. I signed up & even shared the link with my readers!